There are more than 400 different license plate designs for autos in South Carolina. They range from the standard "While I Breathe I Hope" tags to include colleges, veterans, Parrotheads and vanity plates like this one. Most, if not all, states offer a variety of license tags for automobiles. South Carolina offers more than 400, many to support causes or organizations, from colleges to gold star families, or wildlife and habitats, from trees to turkeys and elk. Some are offered out of support and respect, such as veterans or POWs. Some are more whimsical features of South Carolina culture, like the shag dance, or even Parrotheads, the fanatical followers of Jimmy Buffett. Department of Motor Vehicles spokeswoman Lauren Phillips says extra fees paid for these specialty plates allow drivers to support their favorite causes. Vanity plates with names or words also are popular, according to DMV Director of Vehicle Services Larry Murray, who said specialty plates brought the state about $22 million in fiscal year 2017-18, much of which was distributed to organizations supported by the tags. State culture and history are also depicted on some of the tags, such as the state dog, the Boykin Spaniel; the state dance, the shag; and the historic Civil War submarine, the H.L. Hunley. One of Phillips’s favorites is the rare Pearl Harbor survivor tag. Only seven can be seen on the state’s roads, and she is fascinated by the possible stories behind these tags and the World War II veterans they represent. 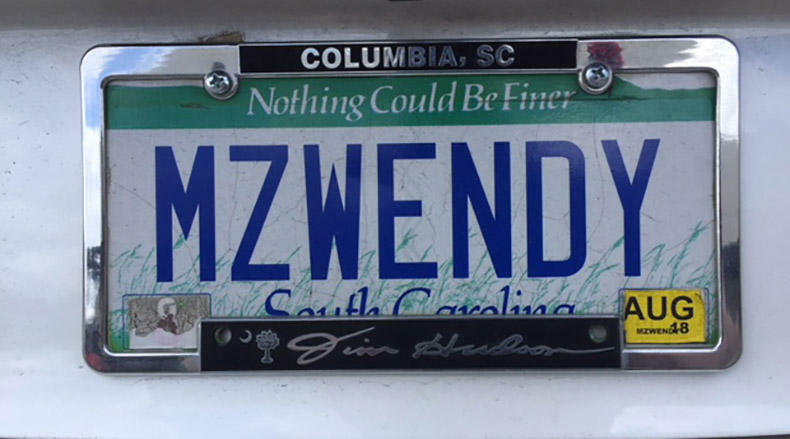 Whatever the subject, the state’s car tags demonstrate that Palmetto State citizens are interested in many causes and events, and they paint a “moving” picture of the state as portrayed by its drivers.